Bourbon-soaked oak chips give the stout beer you'll brew rich vanilla notes and a smooth finish. Isn't it time you made the leap from beer drinker to beer brewer? Get off the sidelines and turn your kitchen into a craft brewery where you're the brew master and your friends and family are the master taste testers! Makes one gallon, or ten 12 oz bottles. These boldly designed, premium brewing kits use 100% malt extract, world-class specialty grains, fresh hops, and high quality yeast: perfect for creating the kind of pints you'll have no problem polishing off. 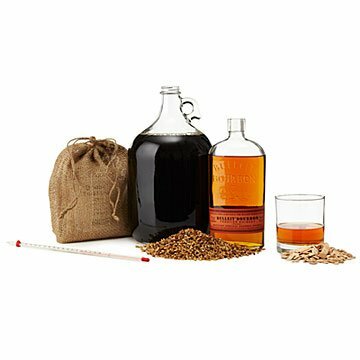 For this particular style, you'll want to purchase a bottle of bourbon to soak the medium toasted American oak chips in (instructions included), so the stout you'll end up creating will be rich with vanilla and oak notes! Assembled in Orlando, Florida with US-grown ingredients. Please note: while the equipment included in the Beer Brewing Kit (listed above) can be reused many times, the ingredients will brew one gallon. Each Refill Kit contains ingredients to make one additional gallon. Hopefully ee will be Drinking soon. My son hasn't made it yet but is looking forward to doing so. Great gift, needs beer bottles. Was a nice DYI beer brewing starter kit. Would have liked to see bottles included or option to buy. I bought this for close friends for their 5 th Anniversary and know they will enjoy it. They go beer tasting and bourbon tasting in places near Indianapolis and when looking on this site I immediately knew they would like it!! Was bought as a Christmas gift. My order was on time and so far seems to be in good shape. Will update after Christmas. This was a great gift for my husband. It doesn't come with the beer bottles you need, but otherwise it's a great gift. He was very happy to receive it! Got the Southern Bourbon Stout brewing kit for my boyfriend for Valentine's Day and he absolutely loved it. Shipped super fast, all the products were high quality and reusable for the most part! Instructions were very easy to follow, took about an hour and a half for initial brewing process before letting it ferment over a few weeks. I would definitely buy another kit just for fun. Great buy! This was a last minute purchase for someone I don't know much about. It has everything you need. Packaged great. I wish I had purchased a few more. Many have asked why they did not get one.